Criminal charges have been brought against the co-owner of the Café Beirut in Petersburg; on November 29, police searched her home. In September and October, the café was searched on several occasions by Investigative Committee, Rospotrebnadzor, and Emergencies Ministry officers. The café believes the only cause of its woes is a casual patron who tried to use the establishment’s toilet last summer, but was turned away. There is generally nothing wrong about popping into a café to use the toilet. The employees of the Café Beirut say they would never turn away polite, friendly visitors. But when an individual makes noise, swears, and might make a less than pleasant impression on diners, they do not see fit to let him in. Thus, this past July, they turned away a young man who, they say, behaved just this way. On September 7, investigators, Rospotrebnadzor inspectors, and Emergencies Ministry officers raided the café and searched it. An employee recognized the young investigator leading the raid as the same young man who had unsuccessfully tried to use the Beirut’s toilet in summer. Another search took place on September 23, resulting in the completely undocumented confiscation of the establishment’s cash register, computer server, order terminal, and charter documents, meaning everything they needed to stay in business. The café was closed for a whole week, but then it opened again, having suffered considerable losses, of course. But that was not the end of the matter. 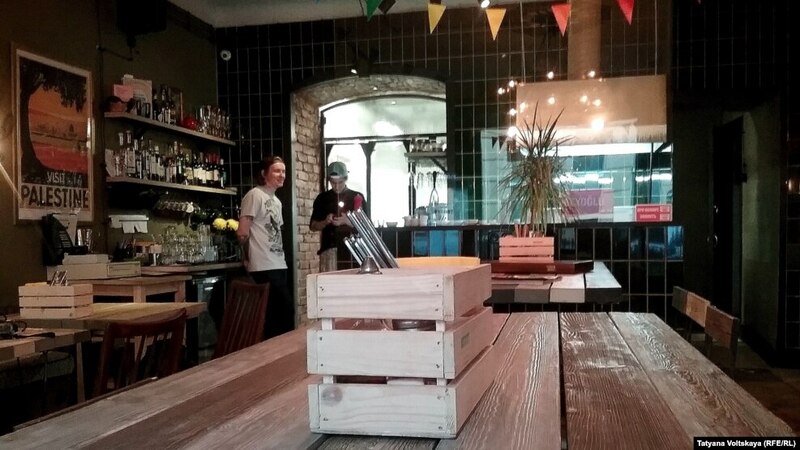 On November 29, police searched the home of the café’s co-owner Elizaveta Izvozchikova, who has been charged with violating Article 238 of the Criminal Code (“Production, storage, transport or sale of goods and products, works or services that do not meet safety requirements”). According to Izvozchikova, the female investigator who led the search rang at her apartment at seven in the morning. I asked what the reason for the first inspection was. “My internal investigation revealed that our manager had seen the young man who turned out to be an investigator: he had not let him use our toilet. We had guests, he had demanded to use the toilet in a rude way, waving his arms and cursing, so he was not allowed to use the toilet. The second inspection, headed by this investigator, took place on September 23. He confiscated the cash register and a bunch of other things. The investigation was then terminated. Later, however, the decision to terminate the investigation was annulled, the case file was submitted for an additional investigation, and another inspection was organized. Rospotrebnadzor and the Emergencies Ministry cited us for four violations. We immediately fixed two of the problems: we installed a missing washbasin and a germicidal lamp. But the other two violations were simply nonexistent. We were told our doors had to be at least one meter wide, and we had to have a second emergency exit. According to fire safety rules, however, wide doors and a second exit are obligatory only for premises larger than one hundred square meters, and if there are over fifty evacuees, but our place seats only thirty people. We explained everything to them and attached documents to our reports, including the cadastral passport, which shows we have only sixty-three square meters of space. We also requested that everything they had confiscated be returned to us, as they had nothing to do with the inspection. Instead of a response, however, criminal charges have been filed. The charges are based on those same two violations, turned up by the Emergencies Ministry, but I do not believe that the Emergencies Ministry officer was unfamiliar with the rules in question. The third violation consisted in the fact that, according to Rospotrebnadzor, we had no right to worked with unpeeled root vegetables; this requires a separate bath or even a whole room. So we ordered peeled root vegetables, meaning we started using prepared food, which we immediately reported to the authorities. But it made no difference at all. I was summoned for interrogation on November 29, but I refused to answer the questions in order to better familiarize myself with the charge sheet. So I will be going to the Investigative Committee on Monday, December 5. While the inspections were going on, we made huge losses. We were closed for an entire week, and many of our clients even now think we are still closed. Nothing like this has ever happened to any of my colleagues, and I continue to hope for justice. We have not violated any law. 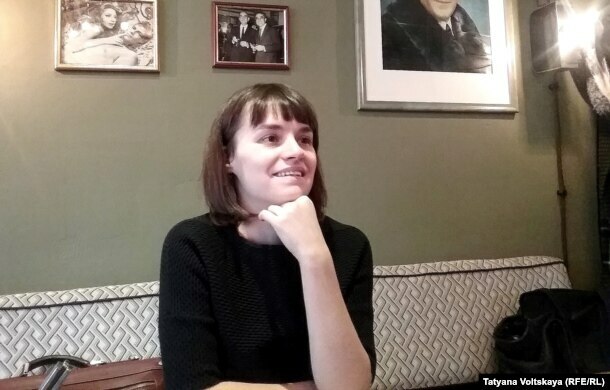 We are conscientious taxpayers and entrepreneurs who are trying to run a small business, and we do no harm to anyone,” says Elizaveta Izvozchikova. Lawyer Boris Gruzd argues that criminal prosecution has not been used for its intended purpose in this case. I asked Gruzd whether there was any hope of punishing those who spin such cases out of thin air. “It is necessary to take steps in this direction. It produces a particularly sharp contrast with the notorious case of the women who was murdered although she called the police because her [ex-]partner had threatened her. But the dispatcher, the best beat cop in the city, told her that if and when she was killed, they would come and describe her corpse. Here, the Investigative Committee, whose remit is grave and especially grave crimes, has pounced on a café. So they have the time and the energy to deal with this nonsense?” notes Gruzd. Alexander Kobrinsky, a member of the fifth convocation of the St. Petersburg Legislative Assembly, says the persecution of the Café Beirut’s co-owner is not something out of the ordinary in Russia. “Recently, everyone watched the video in which security guards tried to keep a drunk man, who turned out to be a police officer, from entering a café. A while later, the riot cops arrived and detained the security guards, who were just doing their jobs. But the situation is understandable, because law enforcement officers consider themselves a superior caste, endowed with special rights, including the right to cook up criminal cases as a means of personal revenge. It is quite widespread, since the law allows them to file criminal charges, suspend business operations, and confiscate tools, computers, whatever. Maybe the charges will be dropped a year from now, but getting a business back up on its feet after such shocks is not always possible. That is why, by the way, prohibiting the detention of people involved in commerce and seizure of their property has now been actively discussed. What point have we reached to openly admit that the vast majority of criminal charges filed against businessmen in Russia is based on mercenary motives and revenge! Clearly there are thieves and con men, but it turns out that they constitute the minority of defendants in such cases. Such is the system and such is the law. We see that a completely peculiar set of circumstances has been established in Russia. I don’t know, maybe Putin was speaking sincerely about the investment climate, but there is no longer any way of manually managing hundreds of thousands of these minor strongmen. In Russia, every police capitan, assistant investigator, and junior assistanct prosecutor is a low-level power broker. They are used to living this way: they have been living this way for a quarter of a century. And they do not want to live any other way, no matter what Putin has said,” argues Kobrinsky. According to Kobrinsky, this mindset—that I am a landlord, and you are my slaves—is very difficult to eradicate. One has the impression that the head of state seemingly has no leverage over Russia’s law enforcement system, that it must be completely dismantled and reassembled anew. On November 29, Elizaveta Izvozchikova was released on her own recognizance. Did these happy looking customers know what danger they were in? The police came to the home of the woman who owns the Café Beirut at seven in the morning with a search warrant. The grounds for the search were serious: the cafe lacked a germicidal lamp. Thus ended the three-month confrontation between the businesswoman and the Investigative Committee. All the might of the Central District’s law enforcement and regulatory authorities came crashing down on Café Beirut, which serves Middle Eastern cuisine on Stremyannaya Street. To our knowledge, no one has complained about the service or quality of the food, but the Investigative Committee, police, fire inspectors, and consumer watchdog Rospotrebnadzor are extremely concerned for the consumer’s safety at this eating establishment. The Beirut is a small Middle Eastern café on Stremyannaya Street. Since early September 2016, it has been a battlefield between entrepreneur Liza Izvozchikova and regulators. The first shot was fired on September 7, when Ivan Lyalitsky, an investigator in the Investigative Committee’s Central District office, visited the café, accompanied by police officers, Rospotrebnadzor inspectors, and Emergencies Ministry officials. Lyalitsky drew up a document of some sort and left. According to café employees who were present, he did not let them read the document. During this first visit, nothing but the cash register report was confiscated. Izvozchikova refused to go to the informal meeting. She went to see the investigator on a weekday, accompanied by a lawyer. They were presented with a long list of alleged violations. Izvozchikov says some of the alleged defects were simply not true. For example, the list stated the café lacked a fire alarm (it had one), that the café’s inventory was not labeled (it was), and that there were no employee health books at the café, although no one had bothered to check them. Izvozchikova admits certain violations, for example, the lack of a chart showing the evacuation plan for the premises. These shortcomings were fixed, and a corresponding registered letter with notification of delivery was sent to the Investigative Committee. The letter was refused, and the notification returned. Lyalitsky made a second visit to the Beirut on September 23. On this occasion, the café did not get off with an inspection, but had its cash register, computers, charter documents, contracts with suppliers, and other papers confiscated. Employees who were present say they were not provided with a list of the confiscated items. The café was paralyzed for a week, until it purchased and licensed a new cash register, and obtained copies of the documents. Izvozchikova’s complaints to the prosecutor’s office and the Central Investigative Department of the Russian Investigative Committee’s Petersburg office were reviewed, but the confiscated cash register and computers were not returned to her, and Lyalitsky’s actions were deemed appropriate. On the other hand, the Beirut was left in peace for a month. The break in the investigation lasted for all of October. On November 9, the Beirut was once again visited by law enforcement officers, whose order of cognac, two coffees, and a salad turned out to be test purchases. No violations were found during the sample purchases, but they were followed by another inspection, led this time by investigator Ludmila Stepanova. A whopping five violations were found: no sink for washing hands in the kitchen, no germicidal lamp, the toilet door opened onto the kitchen, no second exit, and the width of the evacuation passages was narrower than necessary. Izvozchikova installed a sink and germicidal lamp, and reported that the requirements for a second exit and wider corridors should not be apply to her café in accordance with the regulations, since it is small and located on the first floor. It was no use. At seven in the morning on November 29, the investigator came to Izvozchikova’s apartment with a search warrant. From the warrant, Izvozchikova learned that a criminal case had been opened under Criminal Code Article 238.1 (“Production, storage, transport or sale of goods and products, works or services that do not meet safety requirements”), and that “relevant items and documents” might be located in her apartment. No one knew what this meant. The only item investigators confiscated was a Beirut LLC stamp, which no one had hidden. 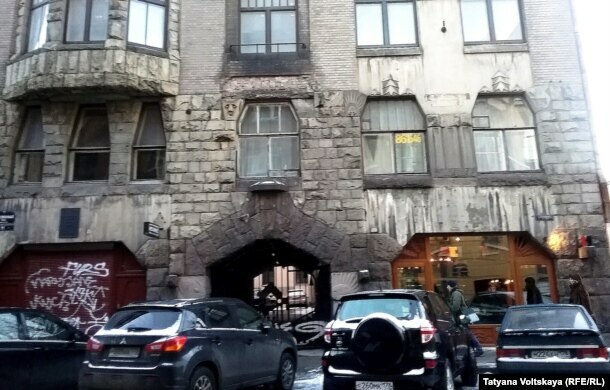 Surprised by the investigation’s intransigence, Fontanka.ru contacted investigator Ludmila Stepanova and asked her to comment on the need for a morningtime search of an apartment in a case dealing with the lack of a sink and an emergency exit in a café. The investigator refused to comment, citing service regulations, and asked us to contact the Investigative Committee’s press service. Such public refrigerators exist in Czech Republic, Spain, Germany, Poland, and other countries. Why can Europeans manage it, but we cannot? We talked about this with Alexandra Lyogkaya, founder of the project Foodsharing: I Give Away Food for Free. “As far as I know, the public refrigerators in European countries also work on the person-to-person system, the same way we wanted to organize it. The authorities there do not interfere with the work of such projects. In Russia, on the contrary, it didn’t take off, unfortunately. “Thank You! was the only team in the city who agreed to try out the public refrigerator project with us. They made their porch available. We did all the prep work together, printing stickers and distributing adverts. It was a completely joint project. We did not vet anything with officials. We thought about it, but probably we counted on the good experience in western countries. “People brought a lot of products—sweets, fruits, and so on—right at opening time. The refrigerator opened at twelve noon on Sunday, and Rospotrebnadzor sealed it on Monday around one-thirty in the afternoon. Even afterwards people came to pick up and bring food. As far as I know, they keep coming even now. They just leave it outside, and someone has picked it up a few minutes later. “We had no restrictions. Anyone at all could bring and pick up food. Of course, many old women and old men came to get food. By the way, originally, the idea had been that the refrigerator would be used by people who could not get food through our group page on Vkontakte. Yet many old ladies said they were also willing to bring food themselves. “I was ready for anything. That the refrigerator would be stolen, that it would break down, that the police and regulatory authorities would come. Rosprotrebnadzor’s visit upset me, of course, but I cannot say I was in shock or didn’t expect it. I tried to be mentally prepared for any outcome. 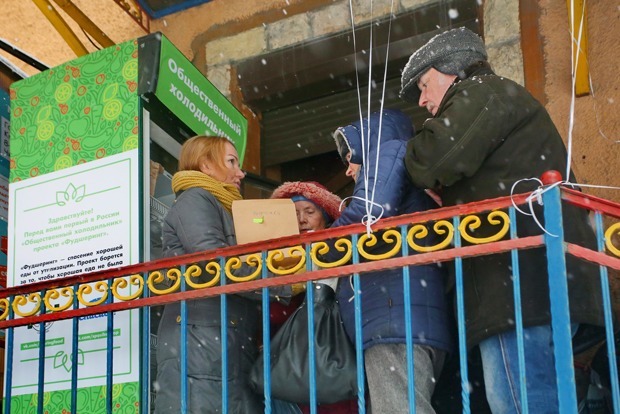 “Rospotrebnadzor told us that a public refrigerator was impossible in Russia. We could organize a cart to feed all comers or a public cafeteria, but not something in which anyone can donate products. So each volunteer would have to have the relevant papers. If you put pasties or jam in the refrigerator, show us your certificates listing the ingredients and how it was made, stored, and transported. “Because our project is purely nonprofit (no money is involved), we would not be able to organize something big-scale like a cafeteria. For now, unfortunately, we have nopt come up with a way of doing an offline foodsharing project that would be legal and just as simple as the public refrigerator. The other day I saw this public service poster, promoting HIV awareness and encouraging commuters to get tested for HIV, on a train I was taking to the outskirts of the city. 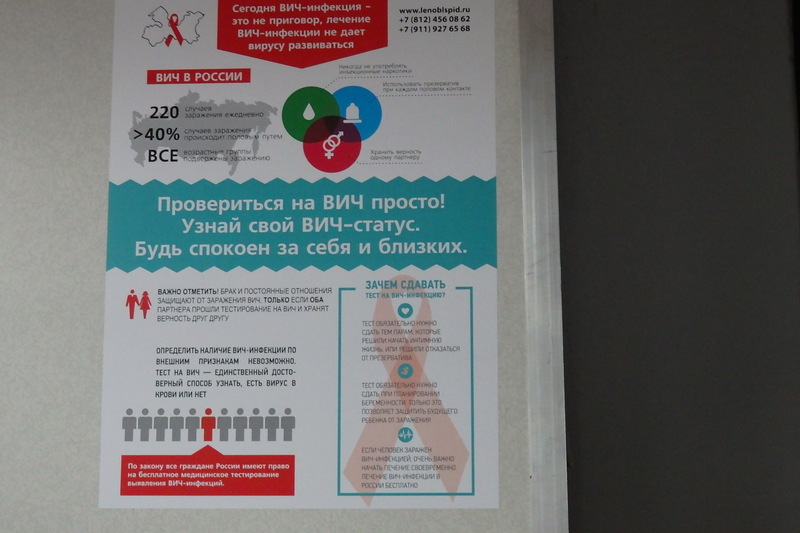 I was more than mildly surprised to see it, because AIDS and HIV had been semi-taboo subjects in Russia for a long while, despite the fact that both experts and public health officials had been acknowledging for the same long while that the country had huge numbers of HIV-infected people and those numbers were growing. It was thus slightly comforting to see the following item in the news the other day. I guess this is what counts for progress in this country, which has increasingly been governed as if it were slightly to the left of ISIS. Russia’s HIV infection rates have become epidemic, spreading to citizens beyond at risk groups, the head of Rospotrebnadzor’s epidemiology supervision department in St. Petersburg, Irina Chkhindzheriya said, the Interfax news agency reported. “We have to admit that the country’s soaring HIV rates can be described as epidemic. About 1 percent of Russians are HIV-positive … The epidemic has broken through traditional limits and is spreading to the general population,” Chkhindzheriya said, Interfax reported Monday. According to Rospotrebnadzor, about 50 percent of HIV-positive Russians contracted the disease by using needle-injected drugs, and 42 percent — through heterosexual contact. About 1 percent of pregnant Russian women are infected with HIV, giving birth to more than 600 congenitally infected infants every year, the report said. “Statistics show that approximately 50 people per 100,000 of the population are HIV-positive, and the situation becomes much worse in the regions,” Chkhindzheriya said, Interfax reported. At the start of the month, the total number of registered HIV-positive Russians numbered 986,657. Editor’s Note. The CIA World Factbook estimated the population of Russia as 142,423,773 in July 2015. Today’s news is impressive even compared to the usual madhouse. The ruble has “stabilized” at just under seventy to the dollar. Vasilyeva, a minister’s lover who stole millions, was released “for good behavior” almost immediately after being sentenced [in May of this year], while the filmmaker Sentsov, who stole nothing and killed no one, was sentenced to twenty years in prison for “terrorism.” Rospotrebnadzor [The Federal Service for Supervision of Consumer Rights Protection and Human Well-Being], which has now replaced the chief sanitary inspector, has banned imported washing products in order to “protect consumers.” And someone else tried to block access to Wikipedia, because it contained “extremism” or something of the sort. The symptoms are clear. Sergey Abashin is British Petroleum Professor of Migration Studies at the European University in Saint Petersburg. His most recent book is Sovetskii kishlak: Mezhdu kolonializmom i modernizatsiei [The Soviet Central Asian village: between colonialism and modernization], Moscow: Novoe literaturnoe obozrenie, 2015. Translated and annotated by the Russian Reader. 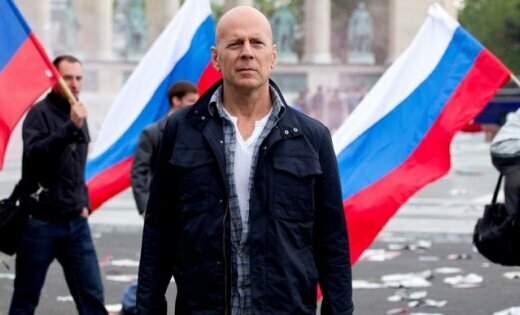 Photo of Bruce Willis and Russian flag wavers courtesy of Google Images.